Originally working retail unpacking stock for Angus & Robertson Bookworld for 18 years, James Kite was retrenched July 2008 approximately a year prior to the company collapsing. Unable to find a job and initially rejected for the dole (due to having a paperless bank account at the time which was a relatively new thing and not having the common sense to simply close the account in question which would have simplified everything), James sought to earn a living by selling stuff (books, toys and clothing) on eBay which sort of worked in the first year but eBay being what it is, they tend to change the rules every 6 months and one such change dramatically changed sales for the worse (an instant drop of 50%) in the second. This, coupled with other factors (to do with the landlords personal life) would lead to his being evicted from where he had been living for the past 12+ years. 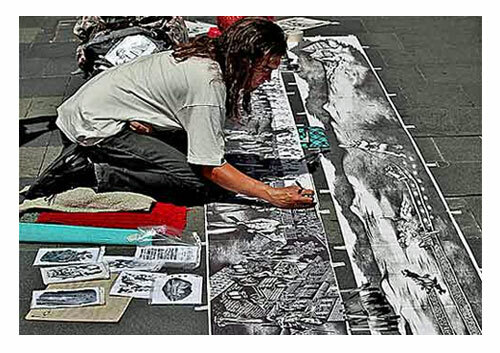 The end result of this run of bad luck was in James taking up busking, specifically drawing with ballpoint pen to make ends meet (The silver lining) and so for the past few years (beginning around July 2010) he has been found on the streets of the Sydney CBD on his knees drawing his panoramas. In addition to which, he gives away A5 prints of his work to his growing fanbase. On average a panorama takes approximately 3 weeks to complete, not including days lost to weather, with the shortest a panorama has taken being 2 weeks ("Sir Douglas Mawson & the Australasian Antarctic Expedition" which was drawn to commemorate 100 years of Australian Antarctica Exploration and is mentioned on the antarctica.gov.au website) and the longest taking 36 days ("Grammy Hall of Fame: ACDC Back in Black" commemorating the inclusion of ACDC into the Grammy Hall of Fame in 2013). As for the number of pens used, the 5th panorama ("Captain Cook: Sailing into Botany Bay"), the only panorama where the pens were counted starting with a fresh pen, took 19 pens over a 21 day period. On the other hand, it is estimated that the 26th panorama ("The Voyager Interstellar Mission Crossing the Heliopause") may have taken between 30 and 35 pens to complete. When starting a panorama, he does not tell people what he is drawing as he runs a competition on Facebook where the first person to correctly guess the title will score a half size test print of a panorama (*at some point). The idea is people can guess once per day as to what the title of the panorama is called and the closest at the end wins. Typically halfway through drawing the panorama, James will begin providing hints. In addition to the panoramas, James Kite produces a number of A5 prints for people to enjoy with the most popular proving to be the "Sydney Opera House" with over 28,000 given away over the past few years. Ranging from landmarks to landscapes, the A5 prints also include depictions of people, animals and various things of a more fantastic, perhaps horrific bent. People who have taken copies have reported giving them to friends locally and abroad (Ranging from Canada, Brazil, England, France, Dubai and Japan for starters), framing them for display in their homes and some who have taken that extra step of having the images tattooed on their own bodies. As popular as the prints have proven, perhaps the most surprising thing (beating the idea that some individuals have travelled a fair distance specifically to see him in person) to James was when people began requesting an autograph, something that he decided to enhance by way of signing, dating and numbering such requests (which currently stands at over 2,900). Future plans include reviewing the option to go beyond simple prints and look into putting together a range of clothing, with a focus on t-shirts initially. For the moment he is looking at using a print-on-demand service, but hopes to actually get clothing done up via a more in-depth service that will allow for a greater range of options in regards to printing.